Here comes yet another classic Disney cartoon to DVD, receiving the high-quality restoration treatment that Disney seems so fantastic at implementing. This time the film is 101 Dalmatians, which is a lovely departure from Disney's typical fantasy tales of princesses and magic. Not that those are bad by any means, it's just nice to have a change (and one that's way better than The Aristocats). The quality of this release is what we've come to expect from Disney, with the clean picture, crisp colors, and excellent sound... it sure doesn't feel like it was made back in 1961! And this platinum edition contains a plethora of extra features, though half of which are games that would really only appeal to the kiddies. The featurettes, however, I found to be quite interesting, especially the reading of letters between Walt Disney and Dodie Smith, the author of the book on which the story was based. The story starts with a Dalmatian named Pongo and his human bachelor pet just hangin' out in their crib. From out of the window, Pongo is scopin' out females, tryin' to find one that he could can get his human hooked up with. When he finally sees one that looks right (and who coincidentally happens to have a very pretty female Dalmatian with her), he tricks his human into thinking it's time for their daily walk and lures him into the arms of the pretty lady. And lets not forget her pretty Dalmatian friend, Perdita. We then flash forward to their wedding day, to see that both couples make a good couple. Next we forward to the day that Perdita gives birth to not one, not two, but fifteen puppies! Pongo couldn't be a prouder dad. Enter Cruella De Vil, an evil vile woman who desperately wants the puppies so that she can have them made into a fur coat. Thankfully, the puppies are not for sale, but that's not gonna stop this diabolical madwoman, so when the humans are away, she has her thugs force their way into the house and steal the little ones! Everyone is horrified when they discover what has transpired, and now it's up to Pongo, Perdita, and a nice lot of good Samaritan dogs to go out and get the pups back before they're turned into a fashion accessory! It's a nice, yet simple story that easily grabs anyone who watches. I think some very young kids might be scared by Cruella, but otherwise this is another Disney release that is more than appropriate for all ages, it's entertaining for all ages. It's cute, funny, engaging, and the puppies are so adorable it's impossible not to become attached to them. Also, the voice acting is extremely well done, though I can't remember a classic Disney film in which this was not the case. It was a good movie back when I was a kid, and it remains a good movie to this day. 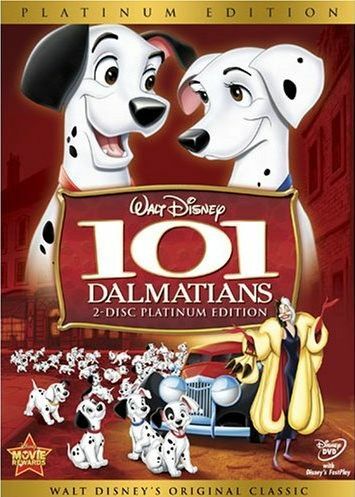 101 Dalmatians: Platinum Edition , released by Walt Disney Video, is available starting March 4, 2008. For the first time in nearly a decade, Walt Disney Studios Home Entertainment unleashes 101 of the world’s most famous dogs when Walt Disney’s original dog classic, 101 Dalmatians: Platinum Edition comes to DVD March 4, 2008 for a limited time only. 101 Dalmatians is the true Disney Dog classic, considered by critics to be one of the best and most innovative Disney animated films. This all-new two-disc Platinum Edition is a must-own for fans big and small, featuring beloved characters Pongo, Perdita, and their 99 puppies, as well as one of Disney’s most deliciously evil villains of all time – Cruella De Vil (ranked on American Film Institute’s Best Villains of All Time List). 101 Dalmatians: Platinum Edition is brilliantly restored with enhanced picture and sound and includes all-new, never-before-seen bonus features that will have fans of all ages howling with delight: An all-new interactive ”Virtual Dalmatian” game with over 101 possibilities to adopt, train and care for your very own virtual puppy, deleted songs, behind-the-scenes featurettes, an in-depth look at the personal correspondence between Walt Disney and Dodie Smith, (author of the book The Hundred and One Dalmatians), and much more. One of the most cherished and sought-after Disney classics of all time, 101 Dalmatians is among the last films to bear the personal touch of Walt Disney. This original classic is available for a limited time only before it returns to the Disney vault. Adopt, name, train and care for your very own virtual puppy where there are over 101 possibilities. Find out which dog you’re most like! The classic song “Cruella De Vil” gets a contemporary twist when multitalented teen Disney Channel star Selena Gomez performs the song in a brand new video! 101 Dalmatians is considered by critics to be one of the best and most innovative Disney animated films. Go behind the scenes with its creators to find out about everything -including the technological innovation of the Xerox process in animation. Inspired by flamboyant actress Tallulah Bankhead, Cruella De Vil has become a villain that movie fans love to hate. Marc Davis, an animation legend and one of Disney’s immortal “Nine Old Men” reveals how this iconic character came to be. Experience Walt Disney and Dodie Smith’s (author of the book The Hundred and One Dalmatians) actual correspondence during the movie’s production. Songs written for the film -finally come to life! When Pongo and Perdita, a pair of adorable Dalmatians play Cupid for their human pets, wedding bells soon ring! In a short time, the dogs become the proud parents of 15 winsome puppies, but their happiness is short-lived. The wicked Cruella De Vil wants to buy the all puppies—to make a coat! When her dastardly offer is turned down, she orders her bumbling henchmen Horace and Jasper to abscond with the puppies as well as every other Dalmatian puppy in London. Pongo and Perdita must rally a network of animals across rk of animals across England with the “twilight bark” to help find Cruella's secret hideaway and rescue 99 precious puppies. I've forgotten where this content and image came from. Sorry! Edited by yours truly (contact me).